Do you know your favorite Frank Ocean song off rip? 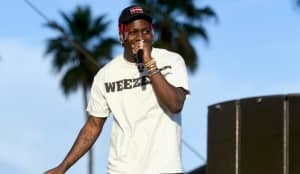 Self-proclaimed leader of the teens, Lil Yachty, has proven time and time again that he's here to stay regardless of the standards anyone holds his image up to. Flexing his creative muscles, he's successfully run the gamut of pop music and hip-hop, acted as creative director for Nautica, and is set to be featured in How High 2. The FADER invited Lil Boat to a little game of Would You Rather to see how he would fare under some left-field questions. He gives a sample of what he would sound like as a navigation guide in Google Maps, quickly answers that "White Ferrari" is his favorite Frank Ocean song, gives the world hope for his cameo on the Netflix show Big Mouth, and reveals his love for Men In Black 2. In the midst of all that, he also confesses that he's not that into jewelry and that he's been rocking all the ice to keep up with the rapper image.